Celebrity Gossip and Entertainment News: Kourtney Kardashian Ordered to Pay Child Support? Kourtney Kardashian Ordered to Pay Child Support? California law may force Kourtney Kardashian to pay child support to her estranged baby daddy Scott Disick. 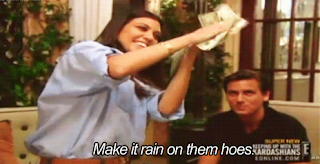 Kourtney Kardashian may be paying for Scott Disick long after their split. The reality stars publicly dissolved their relationship earlier this month after photos surfaced of Disick canoodling with another woman in Monaco. According to an Us Weekly report, Kardashian has consulted high-power Hollywood divorce attorney Laura Wasser to seek sole custody of their three kids: Mason, 5, Penelope, 3, and Reign, 7 months. Kardashian, 36, reportedly wants the children the majority of the time, but Disick, 32, is likely to get continual payouts from her since she is the higher earner, a family law attorney tells Page Six. “Children have the right to live in the lifestyle of both parents regardless of where they are,” explained Goldie Schon, a California-based family law attorney. “While Scott may only have the kids 10 percent of the time, because [Kourtney] is such a high-income earner it’s very likely she would pay him child support. If Scott wants it and pushes it he will likely get child support from her,” said Schon. The TV personalities were together for nine years but never married. Disick — who checked into rehab earlier this year — was a no-show for daughter Penelope’s birthday outing to Disneyland on July 8 and has recently been on a downward spiral of canceled club appearances amounting to thousands of dollars in lost income. Although Kardashian is expected to fight for sole custody, it’s incredibly unlikely the kids will be kept from their father, Schon said. Television drama has become currency for the couple but it’s likely their custody battle will be fought – and settled – behind closed doors. “Kourtney has to fear her reputation and her status as a public figure. She likely has her own skeletons that Scott can use as a way of negotiating,” opined Schon. Request for comment from Kardashian and attorney Laura Wasser was not immediately returned.